Whether at the local, national or international level, economic policy has determinative implications for the enjoyment of human rights. The policy choices made by governments and other powerful actors mark the difference between a life of dignity and one of deprivation and injustice for literally billions of people. Despite these facts, the human rights movement has until recently been hesitant to grapple with the politically contentious field of economic policy, however. When a tiny handful of elite individuals control more wealth than rest of humanity, and countless millions are denied their most basic human rights, this disconnect can no longer be ignored. CESR is on the vanguard of a burgeoning movement that is seeking to bridge the long-standing divide between human rights and economic policy. In accordance with human rights treaties that have been signed and ratified by almost all countries, governments are required to mobilize the maximum of available resources for the fulfillment of human rights. Their economic policies are also subject to precise standards of participation, transparency, accountability and non-discrimination. Moreover, these standards are applicable to both the national and international human rights impacts of economic policies, as governments are obliged to ensure such policies serve to advance, rather than impede, human rights in other countries. Much of the economic instability of recent years, and the pervasive deprivations that continue alongside unprecedented levels of wealth, can be traced back to governments’ failure to comply with their human rights obligations in this regard. Working in close collaboration with partner organizations, CESR is bringing human rights standards to bear in the design and implementation of economic policy around the world. Building on our pioneering work in monitoring compliance with economic and social rights standards, our Austerity and its Alternatives project sees us calling governments to account for ill-conceived austerity programs in countries such as Ireland, Spain, Brazil and South Africa. Alongside this, our Challenging Fiscal Injustice through Human Rights project is bringing the tax justice and human rights communities together in a cohesive and dynamic movement demanding justice in the generation and allocation of resources. In the immediate aftermath of the 2007-2008 global financial crisis, it seemed the injustices of unfettered capitalism, and the shortcomings of the economic planning that went with it, could no longer be ignored. However, the international community has largely failed to learn the lessons of the collapse, and the rise of fiscal austerity and the proliferation of tax abuse are the new norms. 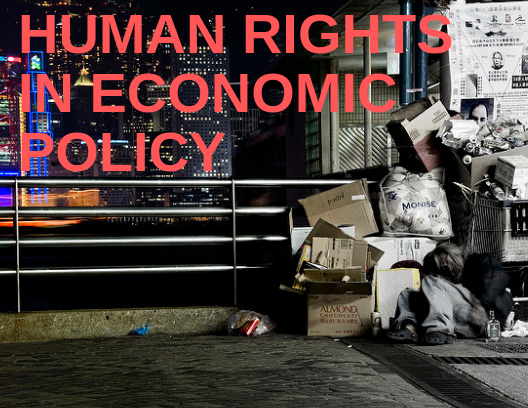 CESR’s Human Rights in Economic Policy Program is challenging these unjust and unsustainable dynamics, by uplifting the transformative power of human rights in economic policy-making. Ultimately, economies must serve the needs of ordinary people, rather than people being at the mercy of the economies in which they live. The UN Special Rapporteur on Extreme Poverty and Human Rights undertook a revealing fact-finding mission to the USA.